SHOCKED or surprised - maybe - but mad, even mortified? Definitely not. It seemed like all eyes turned to Merseyside when Michael Owen signed for Manchester United. The Sky cameras pounced on the unsuspecting passer-by at Anfield, internet forums were monitored with a magnifying glass for bile from our end of the M62 and journalists cooled their fingers before furiously typing up pieces about crossing the great divide, breaking unwritten rules and risking the wrath of the Kop faithful. Meanwhile, very little emotion stirred in yours truly. And why should it? Yes, Michael Owen played for Liverpool once. Five years ago to be precise. That's gone now - long gone. And, harsh as it may sound, the 29-year-old now ex-Real Madrid and Newcastle striker looks a spent force. The searing pace that brought him 150 goals in the red shirt of Liverpool FC left around the same time as England's World Cup hopes in 2006. Since then, he's never been the same so it's a big gamble for Alex Ferguson. Owen must have bite marks on his arms from checking he was awake when Fergie rang saying he wanted to sign him. 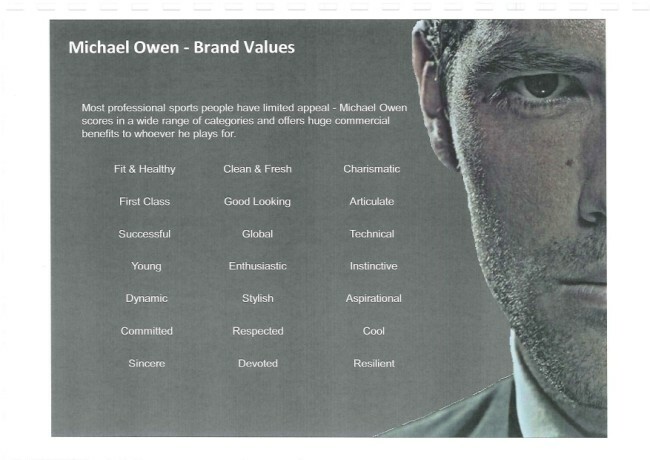 As far as Owen was concerned the chance of a move to a big club had gone - even a finding a half decent one was in doubt, or else, why produce a 32-page brochure telling clubs how good you are? Yes, he's got an eye for goal. And chances are, if he gets a game, and stays fit (two very big 'ifs'), he will score goals for Manchester United. But is he really worth £50,000-a-week plus bonuses? And if it's such a great deal, a coup, a stroke of genius, as we have been led to believe by many 'experts', why did no other top four club - or for that matter any other top team in Europe - come in for Owen? Man U fans have, of course, put some unbelievable spin on the deal. As a Scouser working in Manchester, I have heard a couple of corkers already - from quoting his chances to goals ratio to the pearl "If he scores one goal, he'll be worth it". Converting chances isn't the problem – it's getting him on the pitch in the first place. And how about this for a stat: look at his record of goals per start over 13 seasons - the last three are his 13th, 11th and 12th worst. The other reaction I've encountered is the cocky smile, accompanied by slight swagger, followed by: "What about Owen, eh?" Another overlooked fact is that he would of walked barefoot from Newcastle to come back to Liverpool for a second spell. His advisers have been trying to hammer out a deal to tempt Rafa Benitez for months - as far back as January. The "fact" is, Benitez didn't want him. Where would he fit in anyway? He would never have started ahead of Fernando Torres or Steven Gerrard. And as an impact player? Well Fabio Capello is no fool - and if he doesn't fancy him as a super sub why would Benitez? The slo-mo version of Owen seen in a Newcastle shirt is a box finisher at best - and, frankly, that doesn't suit our style these days. Owen, of course, had his chance to come back to Anfield when he chose Newcastle while marooned at Real Madrid. Instead of following Benitez's advice and calling Madrid's bluff over the transfer fee, and supposedly worried about his England career, he chose huge wages and four years of humdrum, topped by relegation, at Newcastle. And let's be honest - even before all that - a big section of Anfield never fully warmed to Owen. Even the fans that did had their loyalty to the player tested when his contract bluffs meant The Reds ended up pocketing a fraction of Owen's true worth when he left for Madrid in 2004 for just £8million. Loads of goals - yes. Hero? Questionable. He was never in the same bracket as Robbie Fowler and he was never loved like Steven Gerrard or Jamie Carragher. Had it been any of these players strolling down Sir Matt Busby Way talking about signing for United without a "moment's thought", then I could understand the cameras descending on Merseyside and the sly smiles of Stretford-Enders. As it is, it should be the Kopites who are nursing a grin. Because while Karim Benzema, 21, dots the i's and crosses the t's on his Real Madrid contract, Michael Owen stretches his hamstrings in preparation for a possible front-line partnership with Dimitar Berbatov. Oh how I miss working among the Manc idiots. Good stuff Gaz - keep fighting the good fight at the wrong end of the M62. Cheers fella - you know me, I will!